Welcome! I'm always looking for something different and this recipe was and idea that came from my step daughters ( Heather) love for Asian Toasted Sesame dressing & marinade. I recently found a tasty Mandarin & Habanero Rub made by the Louisiana Grill Company. 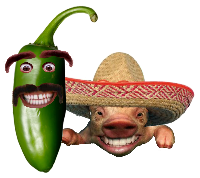 I know your thinking "Habanero" there no way I'm using that! It's too Hot!. I was surprised to find that there is not much heat packed in this tasty rub. The mandarin part of the name made me think about mandarin oranges as a stuffing for chicken and when I went to our pantry to look at spices etc, I was staring at 4 bottles of the Asian Toasted Sesame marinade. It was then I had the idea and what an amazing idea it turned out to be. Let's start this recipe by making the marinade and mopping sauce. This will be a bit out of order then what you see in the video but it won't matter. In a small bowl mix approximately 1/4 cup Asian Toasted Sesame dressing & Marinade with 1 Tbsp of Mandarin Orange juice. This is the Juice packed in the cans of mandarin oranges. Mix this thoroughly and set aside. Next clean and rinse 6 large chicken breasts. 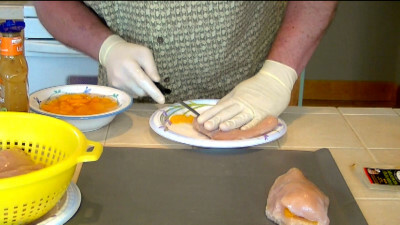 Using a sharp knife open a cavity in each chicken breast. 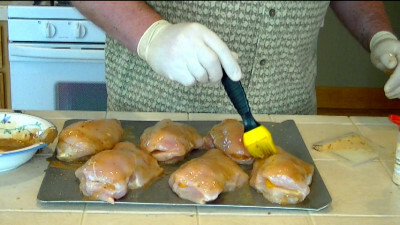 The cavity should run most of the length and width of the chicken breast. Be careful not to pierce the outer meat. 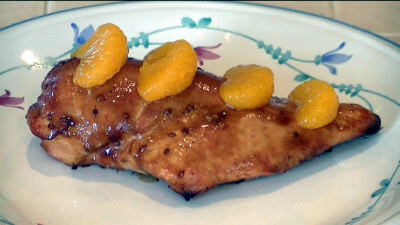 Open each chicken breast and squirt in about 1 tbsp of Asian Toasted Sesame marinade from the bottle. 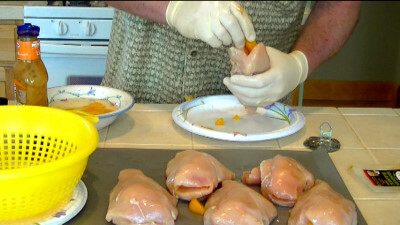 Using your finger work it around the inside of the chicken. 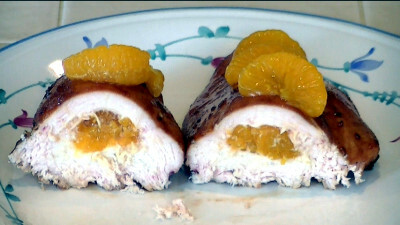 Gently stuff each chicken cavity with as many Mandarin Orange slices you can fit in. Do this gently so you don't crush the orange slice. 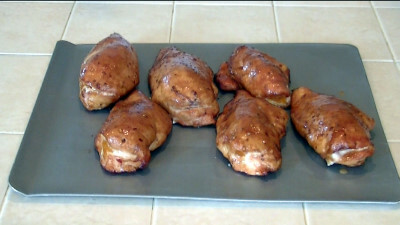 Place the stuffed breasts onto a baking sheet. Using a mop (marinade & sauce brush) mop on a good coating of the mopping sauce you mixed. Shake on a dusting of garlic powder. Shake on a fair amount of the Mandarin & Habanero Dry Rub. Don't be shy its not that hot and provides allot of flavor. Turn the chicken breasts and apply the sauce and seasoning just like you did on the other side. Once the chicken is sauced and seasoned put the chicken on to your smoker and smoke @ 230 degrees until the internal temperature reaches 165 degrees. 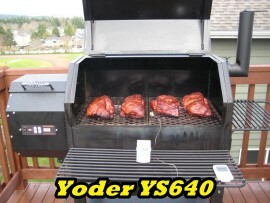 Traeger owners, Set your control to "Smoke" for 1 1/2 hours then move it to 225 degrees. This will ensure adequate smoke flavor. The smoking process will take 3 - 4 hours depending on the thickness of the meat and the temperature swings of your cooker. That said, I always recommend puling your meat based on temperature not time. 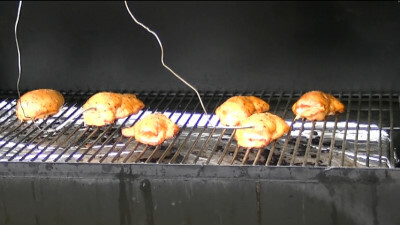 Once the chicken reaches 140 degrees you may insert your "clean" temperature probes. From this point on mop the chicken twice with the marinade. After the first mopping I added a little more of the Mandarin & Habanero rub. When the chicken reaches 165 degrees pull it from the smoker. Let it cool for 5-10 minutes then give it one last mopping of the marinade mix. Plate it up and tip it off with 4 - 6 Mandarin Orange slices. That's it! It's that easy. This recipe will provide for allot of layered flavors with very little preparation. Now serve and enjoy. If you try this and like it I would like your comments.